Fun and Function designs special needs toys, autism toys, and therapy products to build skills and empower children of every ability. They recently sent us a red Fun and Function Peanut Ball for review. 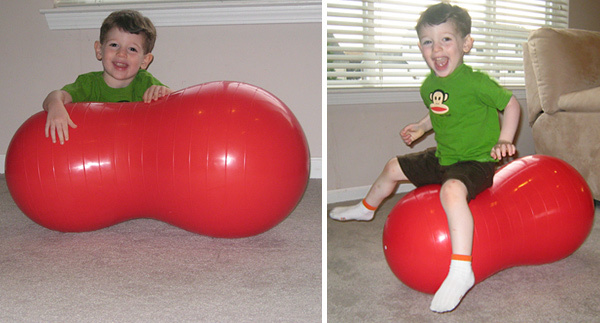 This is similar to an exercise ball that Mom and Dad may use but is created especially for kids because of the size and shape. Ranging in sizes from 12″x24″ to 22″x43″, this peanut-shaped ball will provide hours of enjoyment and creativity. It helps build balance and enhances focus and stability.